Ha 'provocations'. Don't build an island in waters that aren't yours, make it into a military base and then expect other countries to just let it go. Well done - it's a long overdue operation and one that should be thoroughly documented with public video footage of the vessel(s) and its/their proximity to the "island" (i.e., reef). Research vessels should also be sent to explore the sea floor and other marine features within close distance of each reef to emphasize the point that China doesn't own any part of the sea within range of their "islands". What is it with the US and wars? Haven't they started enough in the world? BertieWoosterOCT. 28, 2015 - 08:31AM JST What is it with the US and wars? Exactly, how many US wars or "military interventions" have worked out well, in the last 30 years? I believe Kuwait is their only success story out of the MANY! Why on earth would anyone follow the US lead, when it comes to international, peaceful relations? "Haven't they started enough [wars] in the world?" And therein lies the root of the conflict. This man needs to get his head examined, and a score more top Chinese leaders. What they do is creating an artificial island, basically like sinking a huge seawater exploration platform and then claim it as territory. This is utterly ridiculous. The only country that does not shy away from challenging the Chinese illegality with more than words that can not be understood by Chinese brains is the United States of America. “The actions of the U.S. warship have threatened China’s sovereignty and security interests, jeopardized the safety of personnel and facilities on the reefs, and damaged regional peace and stability,” the ministry said on its website. A lot of big words, a lot of bull. The only country damaging peace ans stability is the one that makes illegal (the Chinese like using that word which has replaced 'meddling in internal affairs') claims of ownership of the SCS like it is an internal lake in China - actually they may be convinced of that. If the Philippines, Vietnam, and Indonesia had a powerful navy they would cruise by the illegally claimed reef to island regularly. Not to mention the ecological damage done by the Chinese. Artificial islands have no associated territorial waters. The unelected Chinese dictatorship has no legal grounds for complaint against anyone sailing near their new military bases. This also applies to the artificial Japanese island of Okinotorishima. Japan claims it confers territorial rights, but legally there are none. Artificial islands have no associated territorial waters. Tell that to Captain Hook. That can't be good for the reefs!! Where is SeaShepherd? if china thinks its in the right and they really want to settle peacefully they should take the US to court! hahaha! If Japan will catch big Asteroid and declare its Japan territory who can do anything about this so same with China they find empty spot in the water and declare Chinese territory. Its still like Columbus time Japan take some island Chinese take something and Putin take Crimea. Anyone can go look and steal something or reclaim from nature and Japan have leading potential in this field. This is a good test by the US, it brings out the arrogance of China that everyone needs to see. The Government of China has to be challenged vigorously, the ludicrous outrageous, illegal, 12-mile (21-kilometer) territorial limit/exclusion zone around Reefs in the Spratly Islands archipelago. @Bertie. The US isn't starting anything. Just recognizing it's right to navigate international waters. Don't make yourself out to be the moron in this thread. @Black Sabbath. LoL@ Captain Hook remark. @Bertie. The US isn't starting anything. Just recognizing it's right to navigate international waters. The US is being deliberately provocative. It's like if someone says 'don't come near me, or I'll punch you', and you step up into their face. Hard to say who is starting it. Silly leaders on both sides. and the alternative then is to sit back and watch China do as it pleases whether its illegal or not? Why does America always have this need to be world police? Who exactly asked them to? If this should be dealt with, it should be dealt with through the UN, and with sanctions rather than provocation. China's assertiveness in that region is even more provocative though. 30% is a lot of trade/commerce moving through there. That aint' peanuts. Also what a slap in the face to countries like Vietnam & the Philippines who also have exclusive rights in those waters as well. It's like if someone says 'don't come near me, or I'll punch you', and you step up into their face. Hard to say who is starting it. It's actually more akin to, "I'm moving into your front yard now and you're not allowed to use most of it anymore. 'Cause it's mine. I brought some dirt over here and planted a tree in it. See? Mine. Don't like it? What are you gonna' do about it?" China is playing the massive asshat card here, and it's doing so precisely because it now possesses the ability and will to leverage newfound muscle -- economic and military -- in intimidating anyone who might take issue with their asshattery. That's bullying defined. The United States has no specific claim to territory in the region, but it does have a significant stake in maintaining stability in a region that sees US$5.3 trillion in trade passing through free and unobstructed sea lanes, lanes that China is attempting to pilfer through highly questionable and creative reinterpretation of international law. Considering I'm raising a family in Japan, a country that will experience direct economic damage if China continues unimpeded on this path of neo-expansionism, I'm personally kind of glad the U.S. is able and willing to step up and say, "No" to China. Someone has to, and it’s highly unlikely that someone will be the U.N., considering China is already playing fast and loose with international maritime laws with nary a peep from the Security Council. I haven't claimed China is in the right here. But that doesn't change the fact that America is escalating the situation. Diplomacy is the key here. Sure it's a lot harder, but the correct move usually is. 'What is it with the US and wars? BertieWooster,Please put your head back in the sand. Strangerland OCT. 28, 2015 - 12:58PM JST But that doesn't change the fact that America is escalating the situation. 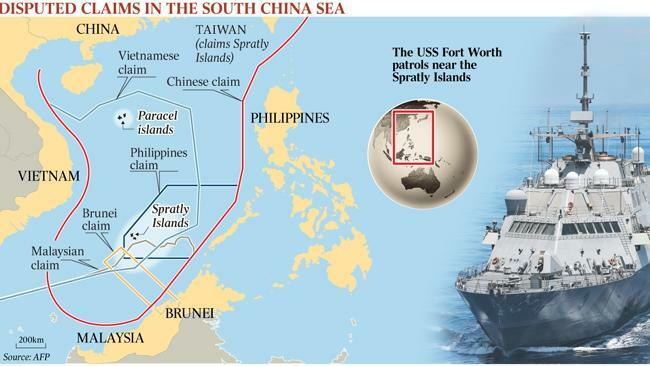 From your Chinese perspective, U.S. hadn't breached the 12-mile limit even though maritime law doesn't usually accord territorial waters to islands built on previously submerged reefs. I'm not Chinese, by ethnicity nor passport, so trying to paint me a such in order to discredit my opinion won't work. I'm speaking as a citizen of the world. That world where America isn't right by default. Please remember that delusional paranoids went to war in Vietnam to protect these trade routes. It all depends on whether China decides to pull the trigger. Please remember that delusional paranoids went to war in Vietnam to protect these trade routes. Er, no. They went to war to stop the spread of "godless communism" in southeast Asia. I don't ever recall the issue of "freedom of navigation" ever being raised by LBJ, Robert McNamara or William Westmorland. Most expect some measure of objectivity from China that has offended at the Philippine's request for arbitration because it will not do bilateral negotiations. But if your talking about China, maybe not. It fails to address why the Philippines do not conduct bilateral negotiations. China has a precondition for bilateral negotiations that of Philippine acceptance of China's nine dash sovereignty claim. The Philippines is not about to condone China's claim to the South China Sea. So far, China has refused multilateral negotiation. Well, they had to tell the masses something that was easy to digest. Ever hear of the Domino Theory? Facts show Ho Chi Min posed little threat which they chose to ignore to support a divided Vietnam nation. I wonder if you still think Osama bin laden had something to do with 9/11? Good luck with that. In the meantime, China will continue to build islands and beef up security unless someone steps up. We didn't ask for this. The UN is not going to move for a long time with PRC on the UNSC. China wants to grab the whole South China Sea. There's no reason to let them. If they can grab pieces off the Philippines, why not let them grab pieces off Japan, as well? Start with the Diaoyu Islands and end with Okinawa and Kyushu. Not sure that would be enough compensation for WWII, though. Nice deliberately provocative photo with the Japanese navy flag fluttering in the foreground. Off-topic indeed. The U.S. is protecting the international waters rights for everyone. Of course they're doing it for themselves first and foremost, but the end effect it's the same for everyone, meaning your countries' ships would be able to sail thru those international waters for whatever reason no problem, without the whimsy from anyone who may change their minds. They're doing the right thing. Freedom of navigation for everyone anytime any reason no questions asked, on international waters. All internationally-recognized maps label those as international waters under international jurisdiction of navigation, so no country (even SE Asian countries) should have a problem when naval ships follow the rules through those waters. Without that international recognition on their side, China's case has nowhere to go, so there's no case. Can't just prop up an artificial land and call the area around it sovereign state; otherwise, countries would be propping up artificial lands on each other's doorsteps. Furthermore, like real estate property rights and adverse possession, if ya don't protect the rights of international waters, ya risk losing those rights and that claim in such area. So ya have to constantly exercise those international rights - otherwise, use it or lose it. China is becoming like the pigs in George Orwell's Animal Farm. Having repeatedly accused others of hegemony, she is fast becoming what she despised most. Last year Vietnam alone tried to stop the Chinese drilling in waters right off their coast but big bully China strong-armed their boats away from the rig. One by one they will get picked off. Other nations with legal claims to areas of the South China Sea need to stand up together. And those sea lanes need to be free for all. Have you seen a map of the claimed territorial waters? China, is having a laugh. Talked about chutzpah. Glad they are being called on it. China arrogance and greed knows no bounds. This is a good test by China, it brings out the arrogance of the US that everyone needs to see. America isn't right by default. No, it is not. And (to borrow your riff), no one has claimed that it was. However, in this case, the law is most certainly on the side of the U.S. or and any other country that seeks to navigate this particular area of the world, a point with which I'm certain most nations affected by China's territorial maneuverings would agree. Is it? Or is it a gray area? (I honestly don't know). Is there a clause that says building new land doesn't count towards a country's waters? Dunno why anyone would be against the freedom of navigation on international waters. Isn't that freedom worth protecting for everyone? The world has enough territories claimed by governments. The last thing the world needs is losing even more freedom of navigation. If you're a freedom-lover, this is good. Every navy in the world (other than china) should line up with a parade of warships and pass within ten kilometers. Starting with the Royal Navy? Yeah right. Obama, Kerry, A. Carter (& administration) are WAY too assertive, arrogant and belligerent in the south china sea. @Bertie. If these artificial "runways" were constructed at alarming rates in the East China Sea , how would that sit with Japan? Would you call it arrogance on china's part or arrogance on MSDF for prudently navigating international waters? Isn't this basically the same principle as China's ADIZ that they set up and America immediately flew their planes through? "A conqueror is always a lover of peace:... he would like to make his entry into our state unopposed;"
Isn't this basically the same principle as China's ADIZ that . . . America immediately flew their planes through? Yes, pretty much the same thing. Again, China took international conventions -- namely the right all nation states possess to declare their own Air Defense Identification Zone, a zone that typically extends to the edge of their Exclusive Economic Zone, and the right to free passage over international waters -- and added their own special twist to it by declaring an ADIZ that overlapped the ADIZs of other nations. The newly announced Chinese ADIZ was aimed primarily at Japan as another volley in the long-running territorial claim dispute involving the Senkaku Islands, however, it effectively restricted the legally protected free passage of commercial flights. Again, in keeping with an established pattern of signing treaties, then adhering to a new set of rules for itself, China laid out terms for passage across this faux-ADIZ that were decidedly belligerent and aggressive, adopting requirements from commercial airlines with legitimate business in the affected areas that no other country in the world required in their ADIZ guidelines. Anyone traveling across the affected zones had to either get express permission to fly over these waters or risk being blown out of the sky by the Chinese military. In response to this, the United States flew two B-52 bomber in, out, through and around the areas of the zone that were still considered international airspace to demonstrate the inherent illegality of the ADIZ. As it -- and any other country interested in rule of law -- should have done. Again, the very idea of extending a traditionally recognized ADIZ beyond the standard 200 nautical miles to overlap that of other countries and simply expect -- through implied threat of violence -- injured parties to simply roll over and comply is ludicrous. Another thinking by the Diplomat, “the U.S. FONOPs are actually a reaction to Washington meeting strong Russian resistance in Syria and other geopolitical hot spots. Because Moscow has “checked” the U.S. in the global chess match, the thinking goes, the U.S. military turned to the Asia-Pacific to flex its muscles.” And also, “The perceived goal here is to demonstrate to Japan, the Philippines, and other U.S. allies in Asia that Washington can sufficiently control the local great power.” However, “Beyond the sphere of U.S. treaty allies, senior Taiwanese and Indonesian officials also voiced little public endorsement in the immediate aftermath of the FONOP, instead calling for the peaceful resolution of disputes and exercise of restraint by all parties. There was no immediate reaction from Vietnam, Malaysia, or India.” Also,” Royal Australian Navy frigates will proceed with a long-planned training exercise with Chinese sailors next week, despite rising military and diplomatic tensions in the South China Sea,” according to ABC News. Chinese nationalism is up, “In fact, the response to the USS Lasser’s maneuvers from Chinese media and netizens alike is similar to the reactions after two of the worst crises in U.S.-China relations: the 1998 U.S. bombing of the Chinese embassy in Belgrade, and the collision of a U.S. EP-3 plane with a Chinese F-8 fighter jet in 2001.” But government media called for “calm”, this is really strange it is as though the government seemed to play along with the US. Look at this, “A tough stance against China might neutralize a potential Republican campaign point against Democratic Party leadership during the 2016 presidential campaign.” Yes, it’s all just politics. China is one step ahead though, “We will explain to the United States the purpose of conducting joint sea patrols in the South China Sea by ASEAN countries and China, Indonesia’s defense minister Ryamizard Ryacudu said.” So, there is no longer a need for the US to patrol in the areas. But what so interesting is, “China has not previously made any officials claims that the two features do have territorial sea status.” So the whole 12 nautical mile territorial sea idea is all made up by the West. “China has not emphasized the ‘12 nautical miles.’ It is the US that helps us to build and reinforce this concept. Then, it is fine for us to accept the ‘12 nautical miles’ and we have no intention to accept 13 or more than 13 nautical miles,” as stated in the Global Times. For China the benefit is, “The U.S. intrusion would give China a more legitimate reason to militarize these maritime features. The logic is this: the U.S. started this game and we are just responding to it.” Well, that is what China has responded, “if relevant parties insist on creating tensions in the region and making trouble out of nothing, it may force China to draw the conclusion that we need to strengthen and hasten the buildup of our relevant capabilities." If it happens again, “The US should not be overconfident about its ability to steer clear of collision. The sea is no less safe than the airspace. If history can serve as a guide, it should remind people how US cruiser Yorktown was bumped by former Soviet frigate Bezzavetnyy in the Black Sea in 1988, though the US was also exercising its "innocent passage" right,” according to the Global Times.